Citation: C N Trueman "Julius Caesar"
Julius Caesar, one of Ancient Rome’s most famous individuals, was born in 100 BC – or near to that year. 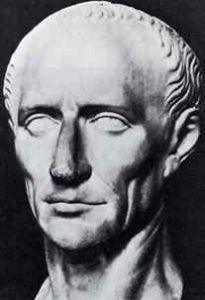 Julius Caesar joined the Roman Army in 81 BC and was the first Roman army commander to invade England which he did in 55 BC and again in 54 BC. Caesar was born into a wealthy family and he was a well educated child who was good at sport. After serving in the Roman Army, Caesar developed an interest in politics. He became a driven man who wanted to get to the highest positions in Roman politics. In 65 BC, Caesar was appointed an ‘adele’ and put in charge of public entertainment in Rome. This was a very important position as the citizens of Rome expected quality entertainment. It was believed by those who ran Rome that the people could be kept happy and content if they had access to varied and enjoyable entertainment. Caesar took to the post with zeal. He borrowed large sums of money to ensure that the entertainment he provided was the best money could buy. He put on games and festivals for the people. As a result, he became very popular with the poor of Rome – a considerable part of the city’s population. He also courted the friendship of Rome’s richest man, Crassus. In 59 BC, Caesar was appointed a consul and in 58 BC he went to Gaul (France) where he served as governor. He was successful in this position and conquered even more land for the Roman Empire. Caesar was a brilliant general and commanded an army of over 50,000 loyal men. His success at a military level all but guaranteed the loyalty of his soldiers. But he was seen by some as a cruel man solely driven by expanding his own personal power. As a result, he made enemies of important politicians in Rome itself. Some senior army generals, such as Pompey, were also very concerned about Caesar’s intentions. In 49 BC the Senate ordered Caesar to hand over his army to their control. He refused. Instead Caesar advanced on Italy but paused at the line that divided France (Gaul) and Italy – the River Rubicon. Roman law said that a governor was not allowed to leave his province. Caesar ignored this law, crossed the Rubicon and advanced to confront his enemies in Rome. The Senate considered this to be a treasonable offence but there was little they could do. Caesar had a very powerful and experienced army and his opponents were fragmented. Pompey was killed in Egypt in 48 BC. For the next three years he picked off his enemies one by one whether they were in North Africa, the Middle East or Europe. Caesar returned to Rome in 45 BC as a dictator. However, he allowed the Senate to continue working – except that he replaced disloyal senators with his own appointments of loyal men. Caesar should have used his position to make powerless those he had removed from the Senate – but he did not. Caesar did not take away their wealth and these men plotted against him. In 44 BC, Caesar was murdered by those politicians who feared that he was too obsessed with his own importance. His murder took place at the Senate House in Rome. After his murder, Rome was divided as to whether it was a good thing or not. “Our tyrant deserved to die. Here was a man who wanted to be king of the Roman people and master of the whole world. Those who agree with an ambition like this must also accept the destruction of existing laws and freedoms. It is not right or fair to want to be king in a state that used to be free and ought to be free today.” Cicero.“People blame me for mourning the death of my friend. They say my country should be preferred to my friends, as if they had proved that killing him was good for the state. I did not abandon him as a friend however much I disapproved of what he was doing.” Gaius Matius.